While Kristaps Porzingis-for-Kyrie Irving makes for a juicy rumor, it also makes for a terrible trade. Here's why both the Knicks and Cavaliers would be better off looking elsewhere. The Kyrie Irving trade front has been relatively quiet of late, as the Cavs search for the right return in exchange for their star point guard. The trade is being complicated by numerous factors, such as LeBron’s future, Kyrie’s true status in the league, and when certain players can be traded. One name that has popped up recently—and made things a little bit more interesting—is Kristaps Porzingis, the Knicks’ blossoming, young forward who ended last season disgruntled with the organization. 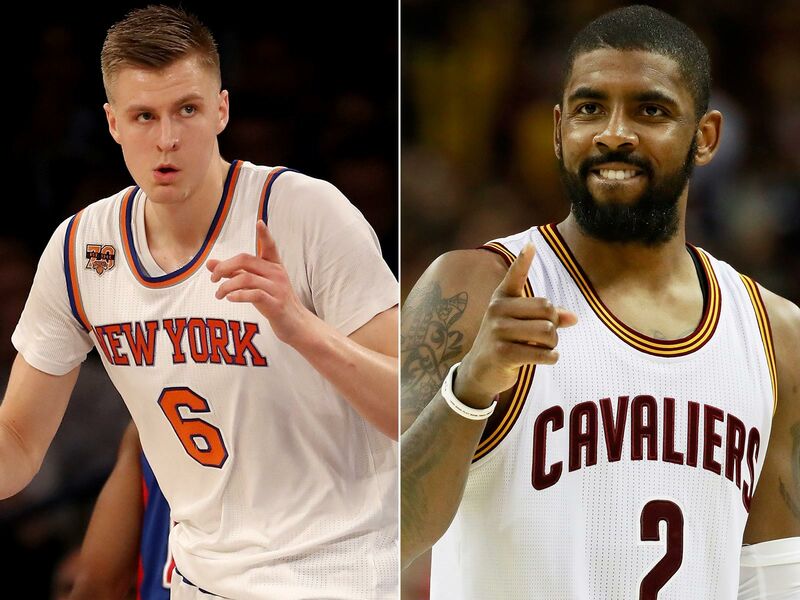 The Cavs have made Porzingis a “primary target” in Irving talks, according to ESPN.com, and Cleveland may be able to start a conversation if it is willing to take back Joakim Noah’s contract. The Knicks allegedly have no interest in trading their unicorn, according to a Newsday report, though this is not the first time this summer Porzingis’s name has appeared in rumors. Should the Knicks really consider trading Porzingis for Irving? No. Absolutely not. Irving’s caught a lot of heat for his decision to ask for a trade. There are, in fact, worse things than an extremely successful NBA player looking for a new, more rewarding challenge that’s outside the shadow of one of the most popular athletes in the world. But as respectful as some (read: me) may find Kyrie’s decision, he’s not the right pickup for New York. In Porzingis, the Knicks have a young player who is already a building block for the future. Perhaps it bears repeating—Porzingis is a 7-footer who can shoot, handle the ball, throw alley oops to himself and protect the rim. He was basically created in a lab to be the modern NBA player. Trading a player like that for a scoring guard—who hasn’t proven he can carry a team by himself—would be extremely short-sighted. Would Porzingis even do well in Cleveland? He would have to adjust to playing with LeBron (and his insane pressure-cooker world) for a year before James likely leaves. Then Porzingis would be stuck with a bunch of overpriced vets like he currently is in New York. Cleveland is undoubtedly in a tricky position with the Irving trade. If the Cavs sell out for the future, then they lose whatever slim chance they have of keeping LeBron. If Cleveland makes a win-now move, its best asset for a post-LeBron rebuild will have been wasted if James leaves in 2018. The best bet for the Cavs is to get realistic about James. Act as if he’s leaving. If LeBron won’t commit, the smart thing for the franchise to do is to get ready for the future. Obviously a player like Porzingis would be a great acquisition for any team. But the Cavs should be looking for multiple assets in return, favoring deals that net them picks and/or rookies that would signal a true rebuild. Irving’s place in New York doesn’t make much sense either. He won’t be leading the team as long as Melo is on the roster. The Knicks just drafted a point guard in the lottery. And New York would be going from bad to worse if it traded its best player for Irving, who would be stuck playing for an extremely depleted, mismatched roster. The Knicks, so far, are doing the right thing by seemingly holding on to Porzingis. But they need to commit. Tell every team he is untouchable. New York has potential on its roster, even with the contracts of Noah, Carmelo Anthony and Tim Hardaway Jr. looming in the background. The sooner the Knicks construct a sensible team around Porzingis, the sooner they can build a contender. Trading Kristaps for someone further along in their career would be a giant mistake for the Knicks, who still have some roster purging to do before they can properly retool. On paper, a Kristaps for Kyrie trade sounds incredibly fun, and it sure as hell is a juicy rumor. In practice, both the Cavs and Knicks could probably find deals that make more sense for the future.